More than a decade afte r Jerry Garcia’s death, the mythology of the Grateful Dead remains, perhaps more potent and insinuating than ever as the jam band universe — virtually created by the Dead — continues to expand, absorb and excite. Phil Lesh, by all accounts, had a good year. His memoir, Searching For the Sound, was a runaway best–seller and actually made the leap into a second–printing paperback edition (quite the feat for a rock ‘n’ roll autobiography). 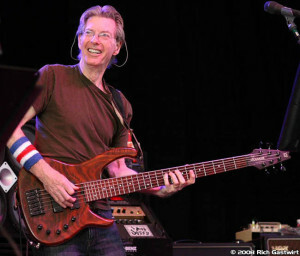 The master of the six–string bass is feeling great, feeling delightfully sober and feeling no lasting ill effects from his 1998 liver transplant, the result of a nasty tangle with the dread Hepatitis C.
He’s kicking off the Phil Lesh & Friends summer tour with a stop at Bonaroo, followed by a two–month trek across the country. This year’s band includes jazz guitar great John Scofield, former Bob Dylan Band member Larry Campbell on guitar, mandolin, pedal steel and everything else with strings, vocalist Joan Osborne, keyboard player Rob Barraco, and drummer John Molo. We spoke with Lesh just before the tour started. It had been just a week since the tragic death of Dead keyboard man Vince Welnick, and the stench was still hanging in the air from the Dead’s first major P.R. disaster — the removal of free vintage concert downloads at archive.org. Naturally, both subjects had to be addressed, along with everything else. Q. Do you still think about Jerry? A. Sure. Not every day, but frequently. It’s not like he’s looking over my shoulder or anything, but he’s in a good space and he’s watching. In a sense, he’s looking in and he’s aware of what we’re doing, the rest of us down here. The sense that I get is that it doesn’t really matter that much to him, because he’s in another place now. At the same time, I get the sense that he’s pleased that we’re continuing. Q. I’d like to ask you about Vince Welnick. A. We worked together early on, when I started Phil Lesh & Friends, and it was a gas. We tried to put it together again, Vinnie had other commitments, and I think we just sort of both moved on. He had his band, Missing Man Formation, and I had mine. It just happened that we didn’t have a lot of contact. But I was just tremendously heartsick and dismayed when I heard that he had passed away. Q. Were you aware of the fingers being pointed after Vince died, that some members of the Dead never treated him as part of the “family” after he’d left the band? A. I had a great time playing with him, every chance I got. As far as “who’s family and who isn’t,” that’s not something you can lay down — you can’t just say “OK, this person’s family” or “This person’s not family.” That’s a concept that doesn’t really have a lot of resonance with me. Because if the crew is family, why isn’t the musician family? I frankly never felt that Vince wasn’t family. Q. You’re actually turning up at blood drives throughout the tour. Why? A. Well, there’s never enough blood. I’ve been through it — I’ve used up a lot of blood in my illnesses. Luckily, there was plenty for me; I have the most common blood type. But there’s always a shortage, and you never know how much you’re gonna need. So I encourage people to give blood, and I also encourage everyone to become an organ donor because it’s the simplest thing in the world. All you have to do is tell your family: Hey, if anything happens to me, I want to be an organ donor. That’s how simple it is. Q. In your book, you very successfully described the telepathy that’s necessary for groups of musicians to improvise together. Not too many people have captured that on paper. A. I’m glad you got it, man, because that was what I was trying to convey. First of all, kind of the experience of that, and also the nature of what it really was: A group mind. Q. Is it easier now to do, now that you’re older, maybe not healthier, but wiser? A. Even if you’re playing with people you have history with, and that have demonstrated that they get the deal, it depends on the context. And it depends on how everybody feels that day. It depends on a lot of variables, but what it mostly depends on is everybody’s desire to let themselves go and not have to play “their stuff,” and not have to show off. And not have to be the lead voice, so that a dialogue, or a conversation, or a colloquy or a symposium can evolve. Q. So the idea is: We’re not going to worry about how we get there, or who gets there first. We will get there. A. If we listen to one another, if we respond to one another’s thinking. Q. OK, but is this still fun for you, after so many years of doing it? A. It’s one of those things that, when it’s happening, it can’t be anything but fun. And it’s the most fun that you can have as a musician, because you’re making up polyphonic music on the spot. It’s not just one voice that’s being improvised, it’s everything. The whole musical texture, the whole thrust of it, the whole direction of it, how fast it moves, what kind of twists and turns it goes through, which directions it’s going in. Those are all things that are happening as a kind of consensus. In a way, that’s a metaphor for a way that together, we can make the world better. Q. I like the fact that with jam bands, there’s really no pre–set formula Obviously the Dead were out there doing it first. Isn’t it like walking the high wire? Q. It works with the younger guys, too, right? Guys you haven’t been playing with for 40 years? A. Oh yeah. The thing is that a lot of these guys are really open to that. Larry Campbell is a really good example. He played with Bob Dylan’s band for so many years, and he was like a pillar of that band, playing great stuff. And yet he really wanted more. He wanted to play more. And so he left Bob’s band, and I kinda snagged him. So now he’s just flowering. He’s playing this amazing stuff that’s almost like, I don’t know, Electro–Celt or something. He’s like some warrior out of ancient history, standing up there playing these laments and heroic tales. Q. Do you use a set list? A. Oh sure. We kinda have to, but how we go through it is completely open. Essentially, I just say “We’re going to do these songs in this order,” but how we find our way between them is gonna be up to us at the time. Larry loves to do these elaborate guitar symphonies as a prelude to a song, so I like to have him do that. Then we just kick the band in at the right moment, and away we go. Q. What about the Dead downloading controversy? A. In all honesty, I had nothing to do with that decision. I was as shocked as anybody when everything was pulled. I thought it was a very bad idea to pull everything — eventually, of course, the audience tapes were put back up. To me, it was kinda like closing the door after the horse had left the barn, because all of those soundboards are already out there — they’ve been out there for years — and they’re out there in digital pristine copies. It’s not like you can stop them from being distributed. So I think the other guys in the band had some bad advice on that. Q. There was some awkward backlash from longtime fans who said the Dead had sold out, after giving the stuff away for years. A. I know, I know, but what can I say? Personally, I get a lot of good things from archive.org. When I was writing the book, I would be writing about a particular period, and I would go on there and listen to music from the period. And it was really helpful. It put me right back into that mindspace. Personally, I love archive.org, and I would be perfectly OK with the soundboards being up there — but I’m just one guy. Q. Will the Phil Lesh & Friends shows be made available? A. We’re going to do instant live CDs available at the shows, and of course by mail order after the show. And there’ll also be downloads of each show available online. We are going to put up one show out of the tour for free, but the rest will be available for purchase. Q. Here’s a thought: What happens if you play a bad show? Not that you probably play too many bad ones any more, but would you send somebody out there to say “We’re not going to be doing a CD tonight, folks …”? A. If it’s a bad show, if people don’t like it, they won’t buy the CD, that’s tough. It doesn’t really matter. I think the point is that’s how we are. We go out there and we take risks. And sometimes we don’t pull it off as well as we do other times. I don’t think there’s going to be a really bad show, but some might be less spectacular than others. That’s just how it works. And some people would want those shows anyway! You never know what people are going to want.